The FIU Aquarius Reef Base has been sidelined by Hurricane Irma, but the world’s only underwater research laboratory should be back in operation by the spring of 2018. The Aquarius habitat sits off the coast of Key Largo, 60 feet deep on the ocean floor. When Hurricane Irma marched across the Caribbean toward the Florida Keys in September, the storm passed over Aquarius ripping the lab’s 94,000-pound life support buoy from its moorings and causing damage to the underwater facilities. Initial estimates put repair costs around $500,000. 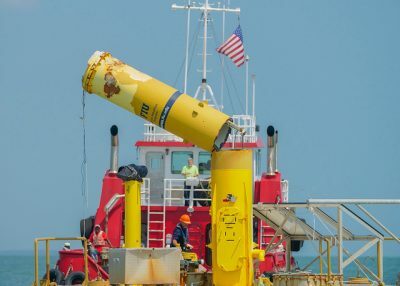 The Aquarius life support buoy is towed to a shipyard for repairs after Hurricane Irma barreled through the Caribbean damaging the world’s only underwater research lab. The wet porch, which serves as the entry point into the habitat, took on excess water and life support systems sustained damage, according to Roger Garcia, operations director of Aquarius. On the exterior, decking, air supply hoses, cabling and other support systems were damaged. Structurally, one of the legs on the four-leg platform that the habitat sits on was damaged and will take some time to repair. As for the buoy, the storm blew it away from Aquarius, and it eventually came to a rest along the Lignum Vitae Channel, about 14 miles from the habitat. The attached mooring line helped bring it to a stop and it eventually floated under a bridge, which is where the Aquarius team found it. The buoy suffered significant structural damage and has been towed to a South Florida shipyard for repairs. The good news, according to Fourqurean, is that the habitat stayed in place and the interior living quarters remained dry. FIU took over Aquarius from the National Oceanic and Atmospheric Administration in 2013 and formed the Medina Aquarius Program, a research and community outreach program. The facility allows scientists to live and work underwater for extended periods of time. In addition to FIU research being conducted there on coral reef conservation, predator/prey behaviors and seagrasses, Aquarius also offers unique training opportunities for NASA astronauts and others. Since assuming operations, nearly five years ago, FIU has hosted 19 research and training missions at Aquarius. Recently, FIU and the Coral Restoration Foundation established the world’s deepest coral nursery there to study possible solutions for the rampant loss of coral reefs worldwide. Throughout it all, FIU has also hosted virtual field trips for hundreds of schools worldwide, giving nearly 34,000 schoolchildren the chance to see the habitat up close and interact with aquanauts residing there. You need to post where donations can be sent.